yar de har har. This be the best, the ultimate, the only necessary collection o’ pirate jokes, original or no. I scoured the raging internets to find these for ye. Respect them well. What size clothing does a pirate wear? Why can’t pirates play cards? Because someone is always standing on the deck. What do you call a pirate with two eyes and two legs? What’s a pirate’s favorite fish? How does a pirate get rid of unwanted treasure? What’s a pirate’s favorite kind of exercise? How do you save a dying pirate? What do you call a pirate with three eyes? What’s a pirate’s favorite continent? What do you call a pirate that skips school? What’s a pirate do after he eats beans? What’s a pirate’s favorite activity at the park? When he’s in the Bay Area, how does a pirate commute to work? What does a pirate like to roast over the campfire? Why didn’t the pirate do his homework? What do pirates do on Saturday mornings? Where does a pirate get fresh fruit? What’s a pirate’s favorite sea-dwelling creature? What’s the pirate’s favorite Olympic sport to watch? Why did the young pirate get such good grades in school? Because he was smarrrrt and tried harrrrrd. What’s a pirate’s favorite gymnastic activity? What’s a pirate’s favorite crime? Who was the pirate’s favorite President? What does the patriotic pirate do on the Fourth of July? What doesn’t a pirate like to do? What’s a pirate always grill with? 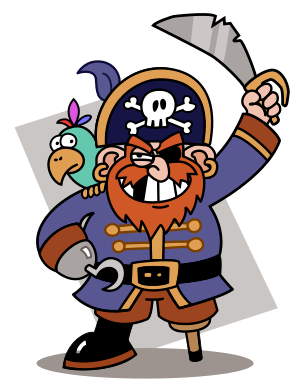 Who’s the pirate’s favorite person at the restaurant? Where does a pirate in middle America shop for everything? Who’s the pirate’s favorite cartoon cat? Whats a pirate’s favorite state? What’s a pirate favorite happy hour drink? What’s a pirate’s favorite wine? What’s a pirate’s favorite Catholic position of authority? What’s a pirate’s favorite month of the year? Why couldn’t the young pirate get into the movies? What’s a pirate’s favorite music genre? Where do female pirates spend all their money? What’s a pirate kid’s favorite game? What’s a pirate favorite instrument? Where do pirates grow their food? Where do pirates keep their cows? What’s a pirate’s favorite bible story? What’s a pirate’s favorite band? Why was the pirate upset about upgrading to an iPhone5? He had to buy a new charrrrger. What’s a pirate’s favorite movie trilogy? What’s a pirate’s favorite body part? Your arrrrrms. Or your hearrrrrrt. Where would you find a fossilized pirate? How does a pirate like his knives? Whats a pirates favorite fast food? What does a pirate do when he gets sick? Whats a pirates favorite charity? How does a pirate laugh via text message? What’s a pirate’s favorite café? What’s a pirate’s favorite Olympic sport? Where does a pirate take his family on Sunday afternoons? What’s a pirate’s favorite baseball team? Where does a pirate play laser tag? What’s a pirate’s favorite football team? What’s a pirate’s favorite radio station? What kind of guns do pirate cops like to use? PIrates always like to sing in? What’s a pirate always score in golf? Why didn’t he cross the street? Why won’t he go to China? What’s a pirate’s favorite animal? Whats a pirate’s favorite tool? What’s a pirate’s favorite herb? What’s a pirate’s favorite cheese? Favorite branch of the military? Whats a pirates favorite letter? Har har! Any that I missed, me maties? Please add your own!